You don’t need steroids to develop a massive physique but what you DO need is the knowledge and intensity of a champion. John Hansen, Mr. Natural Olympia, presents “REAL MUSCLE”. This Training DVD is specifically designed for the Drug-Free Bodybuilder. You don’t need steroids to develop a massive physique but you DO need the knowledge and intensity of a champion. In 25 years of bodybuilding, John won the Mr. Natural Olympia, Natural Mr. Universe, Natural Mr. North America, Natural America’s Cup and Natural Illinois. He not only writes a monthly training and nutrition advice column for IRON MAN Magazine but is also the author of the critically acclaimed book, “Natural Bodybuilding”. “REAL MUSCLE” features the exact training routine that John uses to build his championship physique. 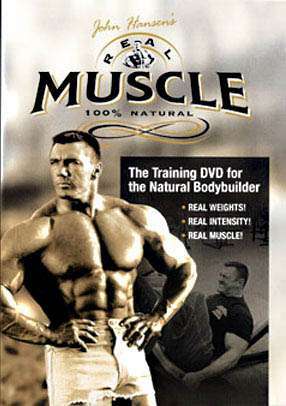 The “REAL MUSCLE” DVD provides both instruction and motivation for the Natural Bodybuilder. Each exercise is shown in two complete sets. The first set is the warm-up set in which John describes the correct form to get the maximum benefit from the exercise. The proper technique of each exercise is crucial in acquiring the maximum benefit from each movement, so this section of the DVD is critical. The second set is the intensity set. John graphically demonstrates the type of intensity that is required to build REAL MUSCLE! You feel the grit and determination as John trains with heavy weights. Don’t miss your opportunity to discover the secrets of developing massive size naturally without resorting to steroids or other drugs.